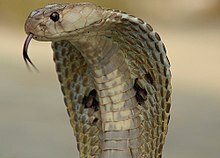 Indian Cobra (Naja naja) or Spectacled Cobra is a species of the genus Naja found in the Indian subcontinent and a member of the "big four", the four species which inflict the most snakebites in India. This snake is revered in Indian mythology and culture, and is often seen with snake charmers. This page was last changed on 11 April 2013, at 08:24.